What does your ritual include? The topic of morning rituals is hotter than the Pareto principle and the center of the sun right now. God that was nerdy. Seriously though, no matter where you are on the interwebs you’ll run into yet another article on the importance of morning rituals. There’s a problem though: I find that most of the articles are either too complicated or too basic, to the point where they’re just fluff and not actionable. I’ve been studying and experimenting with productivity and effectiveness for years. With that said, I thought I would add my take on this topic to the pile, and tactfully set it right on top. Below you’ll also see my exact morning ritual, and I’ll give you links to the apps I use on a daily basis. Create the perfect ritual for you. This is where I aim to really differentiate this post. In order to create an effective, sustainable, and useful morning ritual, you must understand the goal in the first place. You must also understand how to address the root, or as I like to say “the big domino” that makes everything else fall into place. Rituals are the secret to productivity and working more effectively. There is a certain magic about them you’ll understand once you try. Rituals allow you to put the various minutiae of your life on autopilot, so that you can use your brain power to focus on what’s important — creating and solving problems. It’s well-documented (here’s a great book on famous daily rituals) and studied that all of the most famous artists, writers, entrepreneurs, and masters have/had a very specific set of rituals. I challenge you to study the person you look up to most and learn about their daily rituals. Key point: Every ritual is unique and there is no cookie cutter solution. Look to another person’s rituals as inspiration, but don’t try to extract the same effect by copying theirs. How to create your morning ritual. Identify what the highest leverage thing is in your life, the domino that makes everything else fall into place. Structure your ritual around making sure this one thing absolutely happens. For example, waking up early is critical for me. If I wake up early, by 6 AM, I rock the day. The second most important thing for me is meditation. If I do these two things, I’m unstoppable. Everything else is a bonus. 2. Place the big domino first. Once you’ve identified your “big domino” (the one thing causes all the rest of your routine to fall into place) make it one of the first things you do in the morning. Have some fun with this, and feel free to get creative. You can use a piece of paper, create a simple document, or just keep a list in Coach.me (formerly Lift app) like I do. 4. Start with just three items. You know what the most important piece of your ritual is. Now just add two more items to the list that you must do every single day. 5. Start simple and make it easy to win. Some people talk about “flossing one tooth” as an example of keeping it simple. I think that’s ridiculous, but the point is just make it easy to win. 6. Add more actions once the initial ritual is locked in. Research is constantly changing in this area. First they said it was 21 days, but then this was debunked as a myth. Now we’re finding it takes an average of 66 days to build a habit. But that’s nonsense too because it’s just an average. The time it took participants to reach 95% of their asymptote of automaticity ranged from 18 to 254 days. 18 to 254 days. That’s a quote direct from the Phillippa Lally study. The truth is, we’re all different. I know people that need no time at all, and others that need hand-holding constantly. 7. Nail it, then add new habits. Once you nail this routine, add on new habits you want to create. Easy peasy, lemon squeezey! 8. It’s dynamic, so be open to change. Your rituals shouldn’t be set in stone. Eventually, you can also create an evening ritual. You should be open to adjusting and adapting your plan along the way. After a while, you may find that you actually don’t like yoga and the Lululemon’s weren’t worth it. Or you may discover how great you feel after drinking vegetable smoothies. Keeping it dynamic means it’s constantly changing, and that’s a good thing. 9. Don’t get discouraged, it’s about mastering the process. Your ritual will give you power. The act of going through this routine will become an addiction, and at times you may feel superhuman because of it. There will also be times where you feel completely lost because you missed your morning ritual. 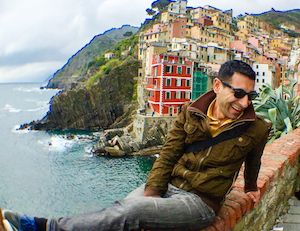 Sometimes this happens to me when I’m traveling (here are 6 ways to stay productive). Stay strong, friendo. Don’t beat yourself up and take steps backwards. Your work is not lost. You’ve been building a muscle, and all it takes is doing the workout again. I like to ensure success and create maximum leverage in everything I do, a strategy my good friend Chad Mureta taught me. Use your personal assistant or a friend/spouse/lover/neighbor to hold you accountable. Promise to check in for the first 66 days of your new ritual. If you miss a day you’ll donate X amount of dollars to an organization you either really love or hate (the latter is powerful for people that are motivated by a negative consequence). To do this you can use Stickk, a free service for setting and achieving goals. With Stickk, you can track your goals, and optionally, set stakes to donate your money to an accountability partner, charity, or anti-charity (my favorite). I also have other actions I track that I aim to accomplish and check off each day, e.g., writing 1,000 words. Apps I use for my morning ritual. Coach.me (formerly Lift) – This is the app I’ve been using to track my habits, create new rituals, and get coaching. Insight Timer / Headspace – I love Insight Timer. It’s not the prettiest app, but there are dozens of guided mediations from great teachers included in the app for free. It also has a cool timer for doing your own meditation. Headspace is the media darling app for meditation, and it’s very popular right now. It’s a beautiful app and it does the job. Feedly – The best news/blog aggregator out there. Use Feedly to “subscribe” to your favorite sites, and do all your reading in batches. It syncs with all your favorite apps too. Pocket – A read it later tool and app. Never allow yourself to get distracted and fall down the article wormhole. Use this to read interesting content later when you plan for it. Outread (iOS) – This app is one of my favorites because it helps me speed read articles. It syncs perfectly with Pocket, so I can jam through articles I saved to read later from Pocket quickly whenever there’s downtime. Audible – The app for audiobooks. I love Audible for when I’m not able to read or I’m in the car, otherwise I prefer Kindle books. New customers can get two free books and three months of membership for only $7.49 per month. Podcasts – The app for listening to podcasts on iOS. For Android, Stitcher is a great app. Elevate – A brain training app that enhances memory, reading comprehension, and writing. Beautifully designed and award winning. Very addictive. Sleep Cycle – The best app for tracking your sleep and logging the data. I’ve been using this for years. Day One (iOS) – An awesome app for journaling and saving memories. I compared many iOS journaling apps and this is the best. I love that you can export everything, and the entries are very customizable. Stickk – A free service that allows you to create “commitment contracts” by setting goals and creating money stakes.